With this year’s release of the box office successful movie Toy Story 3 there has been a renewed interest in all Toy Story toys. The addition of Barbie and the Barbie dolls into the story Mattel is experiencing runaway sales of these character dolls. 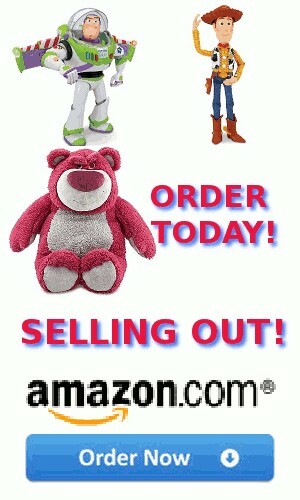 The other very popular toys are the action figures of Buzz Lightyear, Sheriff Woody, Cowgirl Jessie and Bullseye . It is exciting to see these action toys in the hands of small boys as they use their imagination to reenact the movie scenes. This allows boys to play dolls without fear of being teased. As always there are a whole raft of plush toys that in this case feature Lots-o’Huggin’ Bear, Buttercup, Mr. Picklepants, Dolly, Hamm, Trixie, Rex, Peas in a Pod, and Stretch. Children particularly the young ones love the feel of â€œstuffiesâ€. The premise of the movie is that Andy is going to college and all his toys are to be cleaned out of his room. The toys end up by mistake at Sunnyside Day Care where they are given to children who abuse them. The movie centers on the toys trying to escape. Just as the movie has far exceeded sales expectations so the sale of the related toys is out stripping all predictions. They are the most sought after toys for Christmas 2010. Without a doubt everyone who has seen the movie loves it. The Internet is full of accolades about how hilarious, touching, insightful and exciting it is. Toy Story 3 is clever, inventive and deeply moving, a fabulous film which can be enjoyed by all ages. It’s a sign of Pixar’s ongoing brilliance that makes it effortlessly a superior family movie. The toys are set on a fur-raising adventure to escape their ultimate extinction, which might even mean the local dump and the incinerator. Along the way they meet Barbie and Ken, who live the high life, and Lotso’s sinister henchman, Baby Doll, who would happily see them off. Andy’s toys must pull together to escape this. Can they survive? Will they ever see Andy again? Can they play a part in turning Sunnyside into a happy place for toys? And, most of all, will they ever know the joyous love of a child again, justifying their existence and securing their future? It is a sign of Disney’s brilliance that a whole array of new toys has appeared since the movie. A new generation of children has put the Toy Story 3 toys on their Christmas lists.